Surprise! Being back at work is harder than I thought it would be. But not in the ways I thought it would be. I had anticipated achingly difficult days away from my boy, pining for him every moment I was gone. I even considered taking one of his blankies with me to the office so I could bury my face in it and deeply inhale the scent of him when I was missing him so. Turns out I don’t miss him all that much. I mean I do miss him, but not in the all encompassing physically painful way I thought I would. And he seems totally un-phased by the change. There are no leg-clinging tears when I leave for the day, and when I return he may briefly pause whatever busy work he’s in the middle of and give me an, “oh, hey.” But my return is hardly a cause for celebration. I suppose this means we’re well-adjusted? On my end I think it helps that I know he’s home with his father and they are, by all appearances, having a great time together. When he starts daycare in the autumn and we leave him in the hands of strangers, I predict more of those heart-aching blankie-sniffing moments to come, but who knows. What I do find difficult is the pressure I feel to spend every non-working moment I have with my boy. And I want to, I really do, but where is the balance? Social plans – what are those? Weekend swims – who has time for that? Testing recipes and taking photos for this blog – when? WHEN??? I even bailed on a startup project I was really excited about because something had to give (in addition to the above stated things that have also given) and really, there are not enough hours. The thing that irks me is that I know this pressure – in spite of marching around ranting about the patriarchy and lack of balance and all that – comes from within. When Paul was working and I was at home, he had no problem asking for time for himself on weekends, and I had no problem giving it to him. I do think that when Niko starts daycare and we’re both working we’ll be able to divide and conquer and it’ll be easier for me to carve out some time for myself. But for now the pressure remains, and I’m not exactly sure how to handle it. Because I’m spending as much time as possible with Niko, Paul is doing the lion’s share of the cooking right now. The cooking I’m doing is relegated to weekends, during nap time, and is mostly of bulk-prep nature. Good thing that bulk food prep seems to be in my DNA. 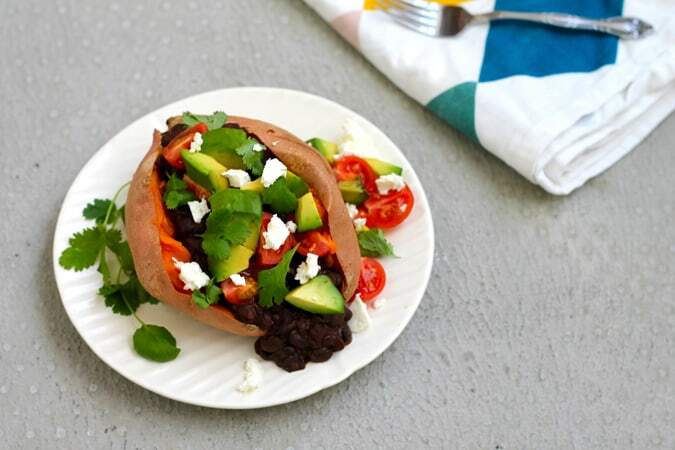 I wanted to call this recipe sweet po-tacos or something along those lines, but more than layering a baked sweet potato with typical veggie taco toppings, what this is really about is the value of cooking up a big old pot of beans. You’ve seen these beans before, and perhaps like me they’re something you make often. They’re definitely one of my standby’s, and once I discovered that Niko loves beans, I started making them with renewed frequency, only leaving out most of the salt and the chili flakes to better suit his little palate. For his meals I portion the beans into silicon muffin cups and freeze them, then pop the batch into a bag so I can pull out little pucks of beans one by one. He likes them straight up, or we use them to make one-year-old sized bean and cheese quesadillas, which he feeds himself with great gusto. And for the bigger people in our house, we use them in tacos, nachos, huevos rancheros, or good old beans on toast. 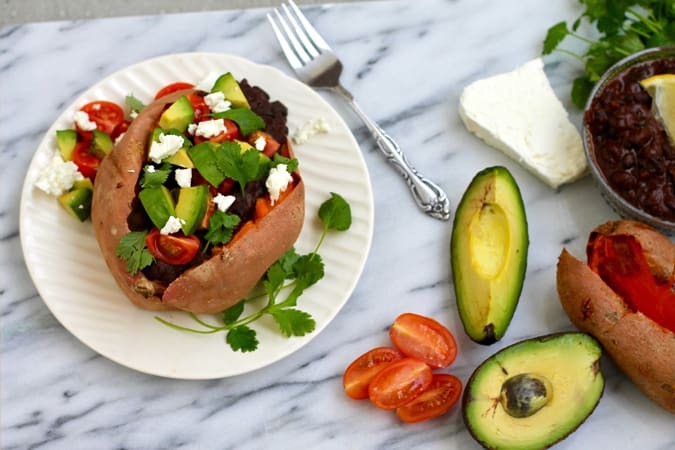 And then there is this, the loaded sweet potato, or po-taco if you will. They look impressive, but if you’ve already got the beans made it’s simply a matter of chucking a few sweet potatoes into the oven and preparing some toppings. Here I’ve used cherry tomatoes, which in my opinion are the only tomatoes to be tolerated outside of actual tomato season, diced avocado, cilantro, and some crumbles of goat cheese. You could add some hot sauce or salsa as you like to do. 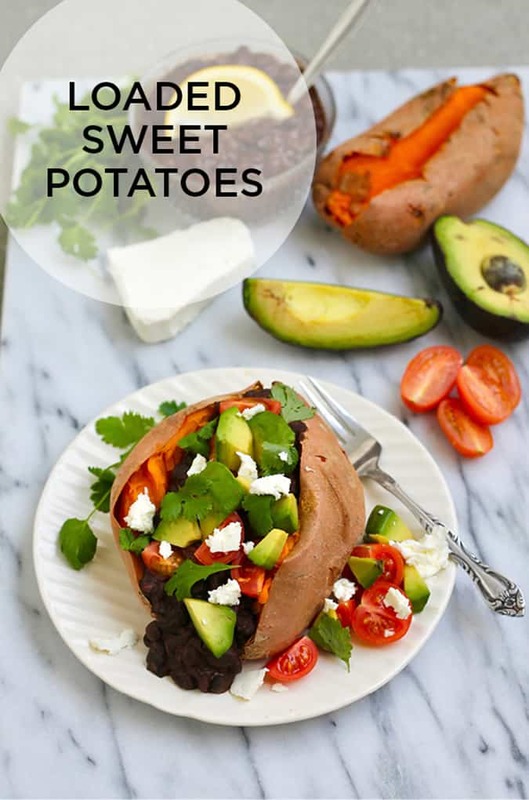 It’s worth noting also, that a couple of sweet potatoes tossed into the oven and baked as a part of your weekend meal prep can be spun into so many different things (soups! smoothies! salads!) they’re well worth having on hand. Beans, b*tches! Black beans are a good source of folate, dietary fiber, protein, phosphorus, iron, copper, magnesium, manganese, potassium and vitamin K. The protein-plus-fiber combination in black beans is one of the things that makes them special. A one cup serving contains 15g of fiber (over half of the daily recommended intake), and 15g of protein. Much of the fiber is indigestible, which supports digestive health, particularly in the lower part of our digestive tract. The protein-fiber combination is also key in stabilizing blood sugar levels, as both protein and fiber move through our digestive systems at a moderate pace. Black beans are also rich in soluble fiber, which is helpful for lowering blood cholesterol levels and supporting cardiovascular health. You know what they say, beans beans good for the heart… but if the second part of that rhyme concerns you, be sure to discard the soaking water when cooking dried beans. You’ll be tossing out a good amount of flatulence causing compounds, as well as some of the phytates and tannins that lower nutrient availability. 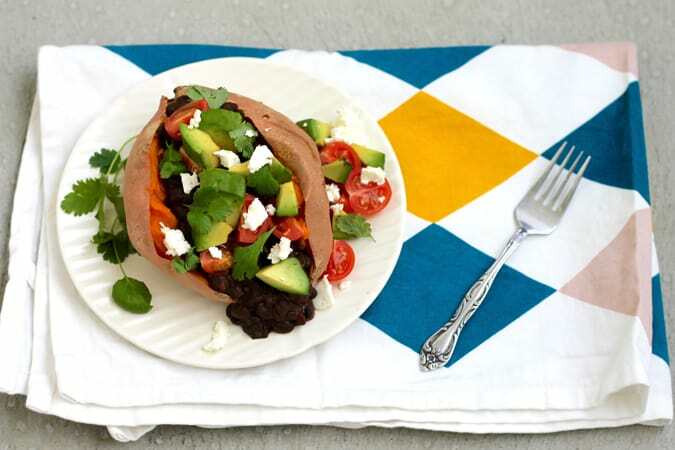 A thick and spicy black bean ragout is a perfect topping for baked sweet potatoes. Garnish with typical taco toppings to make po-tacos for an easy weeknight dinner! In a large heavy-bottomed pot, combine everything except the lime juice (beans, water, onion, garlic tomato paste, cumin, oregano, smoked paprika, chili flakes - if using - and salt). Bring the mixture to a boil over high heat, then reduce the heat and simmer over medium-low heat until the beans are tender. This could take a couple of hours if you haven’t soaked the beans in advance. Continue to simmer, uncovered, until the beans start to reduce and thicken. Stir the pot every once in a while, scooping the beans up from the bottom of the pot. This could take another hour or so. If you like a thicker bean ragout you can puree a small amount of the beans (I use a hand blender right in the pot) towards the end of cooking. All told I find that this takes about 3 hours to get the thickness I’m after, but bear in mind they will thicken a bit more as they cool. Once the beans are done cooking and are nice and thick, stir in the lime juice and adjust the seasonings if necessary. Split the potatoes down the middle and place on a plate. 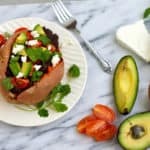 Add a big scoop of black bean ragout, then top with tomatoes, avocado, goat cheese, and cilantro. Add a squeeze of lime juice over the top if you like. I LOVE sweet potatoes!!! What a great way to add all the things you love (well balanced, of course) to make a great meal. The making time for you gets easier as they get older. But I’m such a strong believe in it. And it’s gooooood for your kid(s) to look at their Mom and go ‘dang, that lady sure knows how to make herself happy’.